My paella was made with with chorizo, green peas, shrimp, clams and bone in dark meat chicken. It was practically overflowing off the pan. The key is to cook the the chorizo first so the oil has its flavor. Pan fry the chicken in that same oil and put it aside. Cook the rice in that same oil and then slide the clams in at the end so when they open up, their juices trickle down through the rice. Mmmmmhmmmm! It was so good! I love this stuff. I don't have it very often. But if I go to a Spanish tapas restaurant or a Filipino party that has it, chances are I'm going to shove it down my throat. 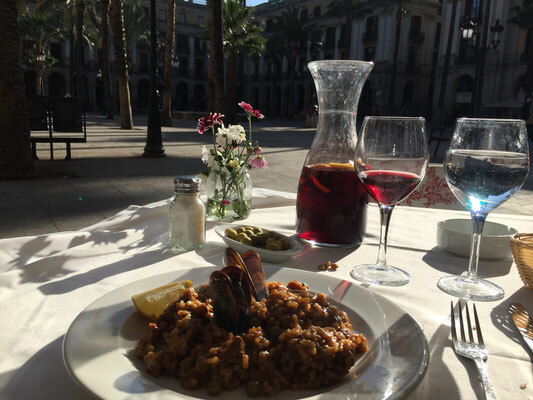 Being in Spain, it just made sense to taste the dish where it originally came from. 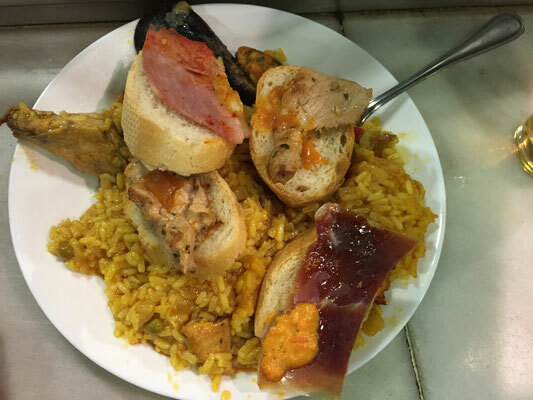 But as much as it is considered the National dish of Spain, I should have done a little bit more homework. The dish originally came from Valencia, Spain. It is on the coast off of the Mediterranean Sea and nowhere near the cities I was visiting. It was a few hours away southwest of my first stop Barcelona, and a few hours away east of my second stop Madrid. Nevertheless, I was determined to find Paella that would coerce me to never leave the country. 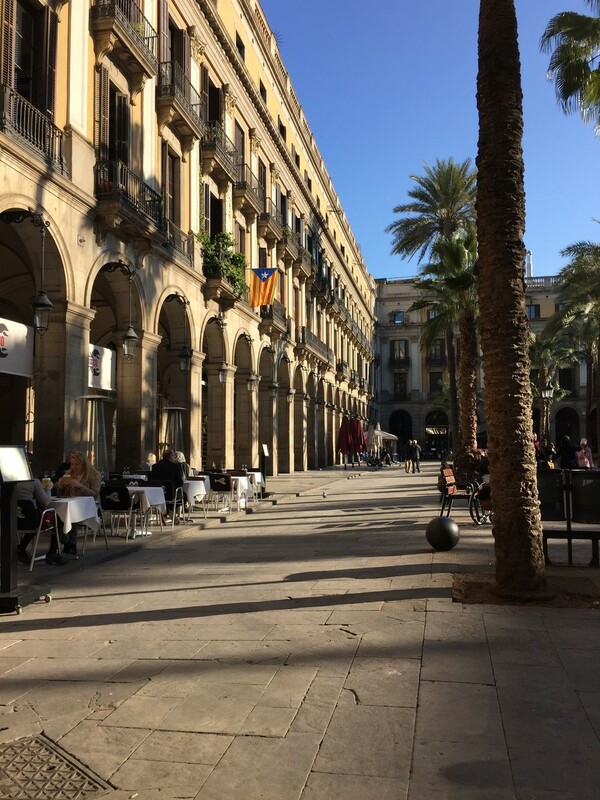 My first endeavor led me to a restaurant in Old Barcelona a block away from my AirBnB called Les Quinze Nits. It started out great. 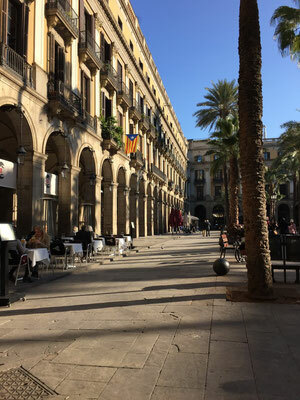 The restaurant was in the beautiful Plaza Real with an outdoor patio. The weather was perfect. 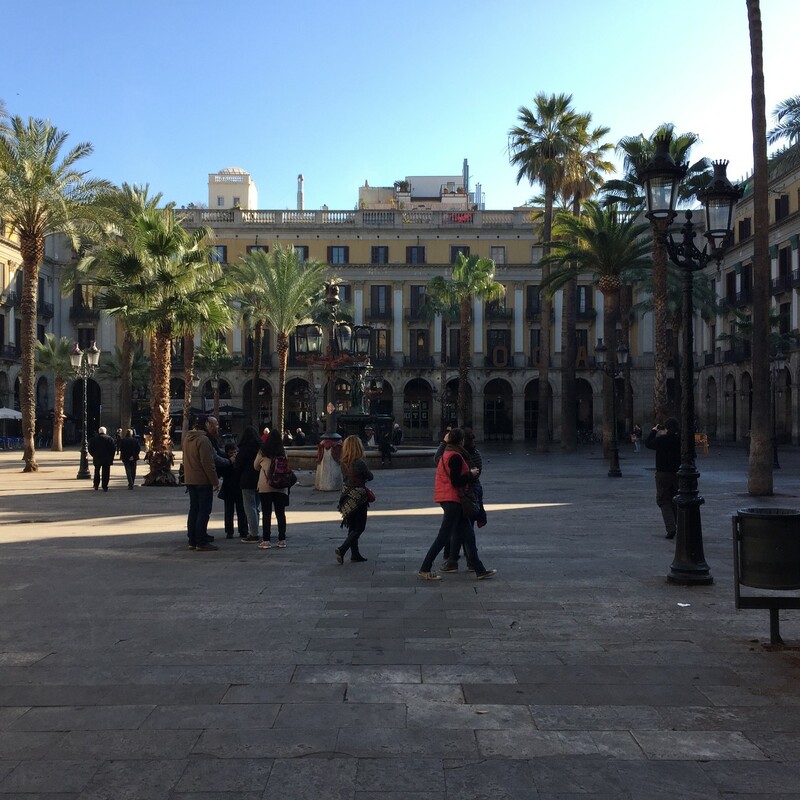 There were palm trees everywhere and buildings with balconies with intricate details lined the plaza. 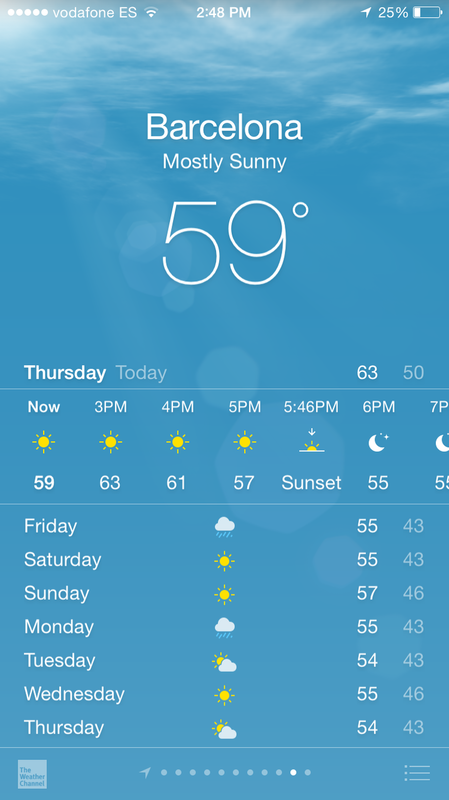 It was the warmest day on my trip so far. 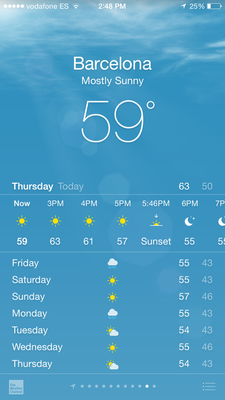 Apparently, it doesn't get that cold in Barcelona. I ordered a half carafe of of sangria. It was really good and surprisingly cheap. In fact, everything was cheap. My lunch consisted of 3 courses for around €13. 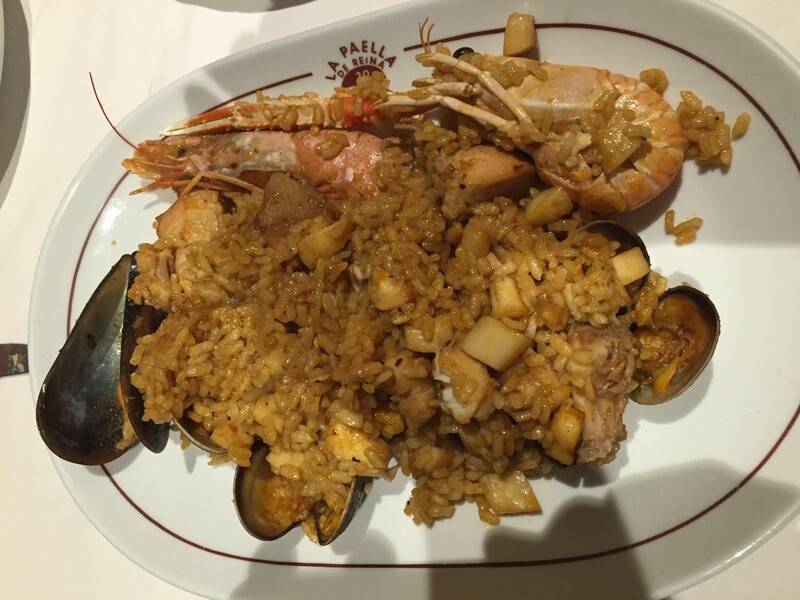 I got a cod salad to start, Paella for my main course of course, and some kind of dessert. 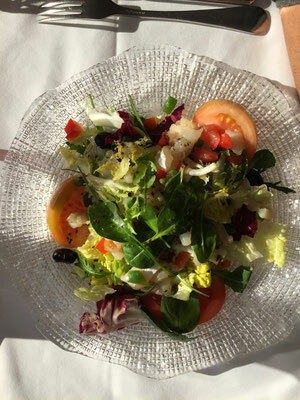 The salad was pretty but I didn't expect the cod to be raw. To this day, I still don't know if that or the smoked salmon sandwich I bought at the Charles de Gaulle Airport in Paris was the cause of my three day upset stomach. Note to self: be careful of what I eat abroad ESPECIALLY if I'm renting a room in someone else's house. Too Much Information?!? You're welcome! :) Either way, this wasn't the place. Their Paella was too soft, too dark and came with two mussels. However, I'm not ready to write this restaurant off because they have some great reviews on Trip Advisor. And have no proof that I got sick from this place. But great Paella, it did not have. My search took a pause and continued in Madrid. The tapas in Barcelona were so divine, I couldn't possibly focus on anything else food wise. After 3 days in Barcelona, the search continued. When I checked into the Hotel Regina in El Centro neighborhood of Madrid 3 days later, I was so relieved. The nightmare of living under someone's roof and having stomach problems was over. Don't get me wrong. My hostess was an adorable and lovely woman. I taught her some English. We practiced my Spanish. Consequently, my Spanish was much better after a few drinks. But isn't that what everyone says? Not to mention, how can anyone beat a private room for under €20 in the heart of the action. But I was just ready to have my own private space. For €53.29/night, I got my own comfy bed that got turned down every day, my own hotel quality bathroom with marble floors, a minibar and a flat screen tv that somehow hypnotized me into watching Italian game shows more minutes than I care to admit. What a find!?! Suggestion: Travelling during the off season lends itself to more affordable ventures and accommodations. A friend of mine was finishing up his Master's degree in town. Coincidentally, his apartment was just a few blocks away from my hotel. 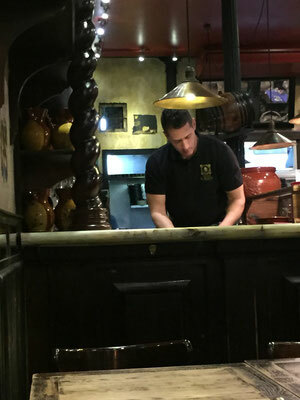 I met him and his friends at this restaurant called Paella de la Reina on Calle de la Reina four blocks away from my hotel. Guess what we ordered? 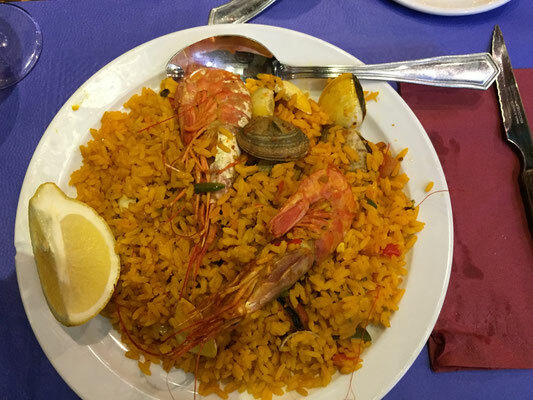 Seafood Paella and vegetable paella. 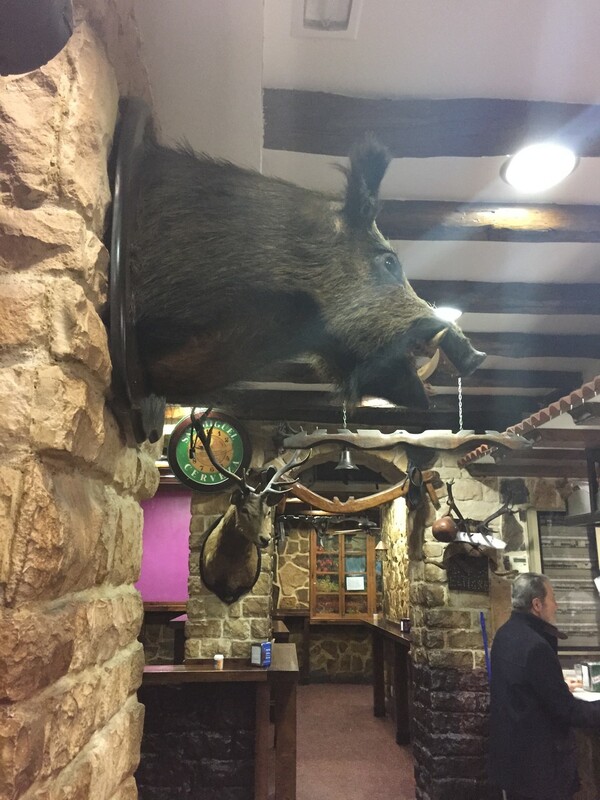 We also ordered a bottle of Rioja. I still couldn't shake off how cheap it is in Spain compared to Paris. And let's not even compare it to London prices cuz I'll just have angry thoughts and my blood pressure will go up. When I was there in January, it was $1.55 to the pound. The vegetable Paella had fava beans, green peas, carrots and green and red peppers. 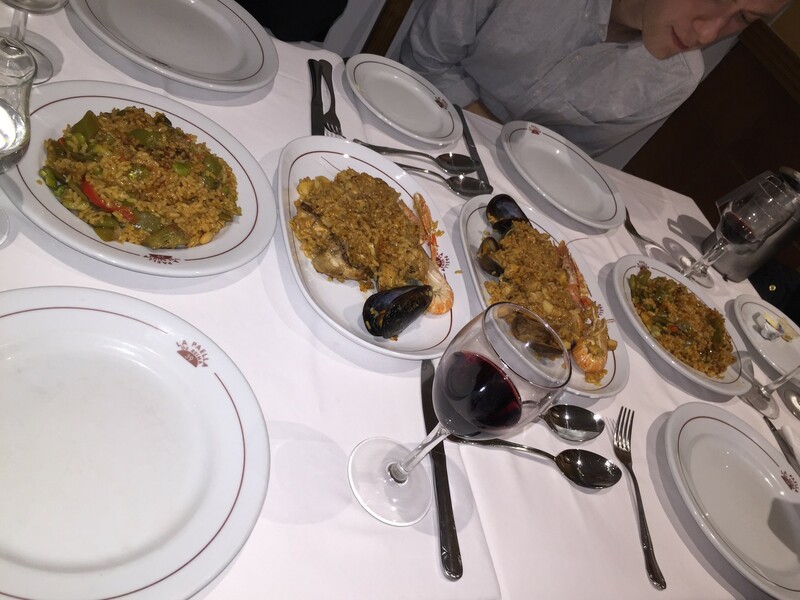 The seafood Paella had clams mussels, shrimp and scallops. My daily dose of chlorophyll and good cholesterol was definitely met. They were both really good and very flavorful. This time, the rice didn't look mushy nor did it look really dark. But somehow, I'm still not satisfied that this was what I was looking for. At this point I was starting to second guess myself. Are my standards too high? Do I really know what it takes to make excellent Paella? I made it a few months ago! Was I just putting it on a pedestal in comparison? And God knows when I had it last at a restaurant. Still, I wasn't ready to give up. My next venture led me to a well reviewed restaurant on Trip Advisor called Venta El Buscon. 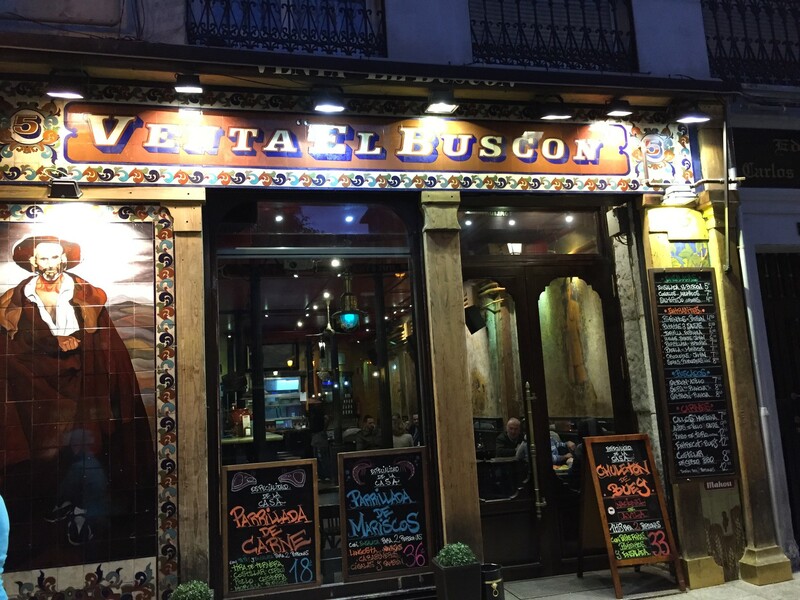 It is a tapas place (but they also serve Paella) that's ranked #188 out of 7,320 restaurants in Madrid not far from my hotel. It took every ounce of energy in my body not to order a bottle of wine. They were was so cheap. A bottle of their house Rioja which was made out of 100% tempranillo grapes was €8! 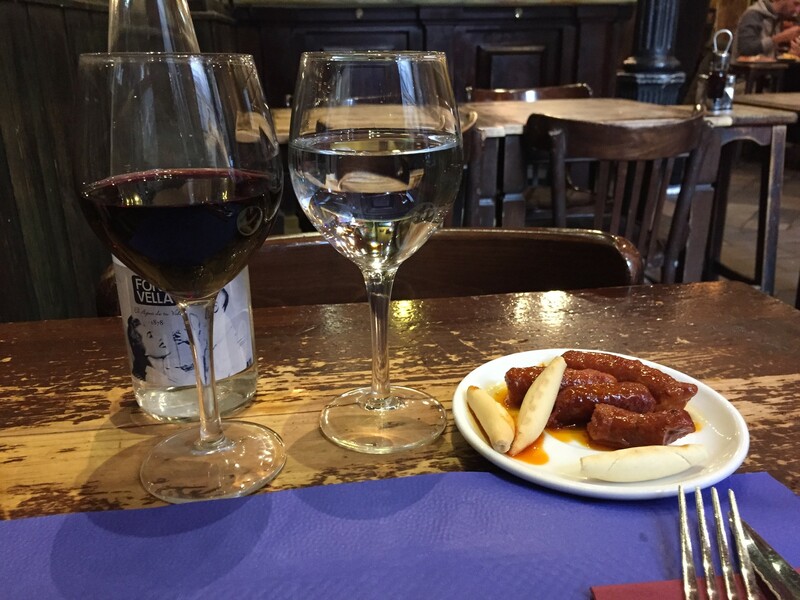 The cool thing about getting a drink in Madrid was that they gave a small plate of tapas every time I ordered a drink. I didn't even have to order food if I didn't want to. But tacky and my name don't belong in the same sentence. Plus, I was excited about trying their Paella. They served 3 pieces of sweet chorizo and some crackers formed like roll-ups with my glass of wine. Wow! That chorizo was no joke. I could eat a gallon of that but my doctor would be mad. It was savory with just enough fat. Very tender. It went so well with the glass of Rioja I ordered. 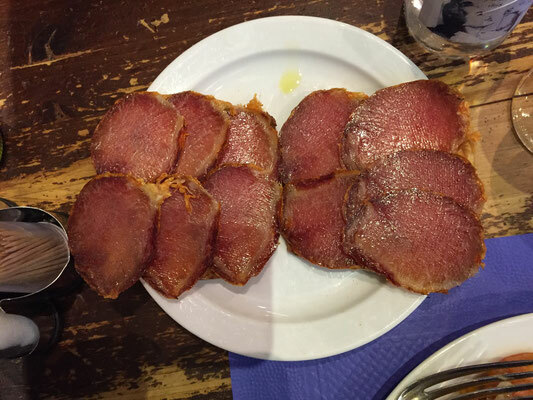 I ordered a small plate of Jamon Serrano on top of toasted bread. It was good. I'm just partial to Jamon Iberico with it's deep red color and thin slices. This one was on the thicker side. Tasty none the less. Then I had their seafood Paella. It was delicious. I would give it a B+/A-. The saffron color was even better than the previous restaurant. But it only came with shrimp and clams- a minor detail. Overall, I had a good dinner here. The view contributed to the dining experience if you know what I'm saying. Wink Wink! 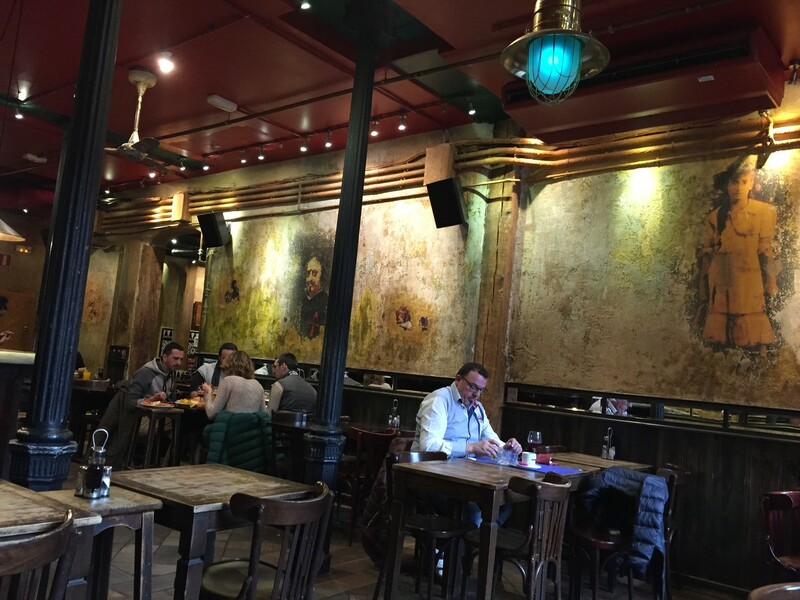 The place had a cool vibe to it mixing more traditional murals on the wall and distressed hard wood floors with modern recessed lighting coming out of the red metallic ceiling. Quick note- Not a lot of Spaniards speak English so brush up on the Spanish you learned from high school. If not, download the Duolingo app from the iTunes store. It's a great practice app for numerous foreign languages. Another friend who studied in Madrid suggested I go to El Tigre. He said they serve a heaping plate of tapas for every drink I get. I was skeptical. How do these bars and restaurants stay in business if they keep serving food with every drink they pour? But since I have been in the country for a few days now, I have seen proof that most, if not all, serve a tidbit with every drink. I ordered a beer on tap for €2. And as I was fooling around on my phone for a few minutes, the bartender plopped down a plate full of Paella covered in tapas. I looked at him and then looked around me and pointed to myself. He said yes it's for me. I was shocked even if I knew it was coming. The plating presentation SUCKED! But then again, I was at a bar with hardly any seating area; not a fine dining restaurant. 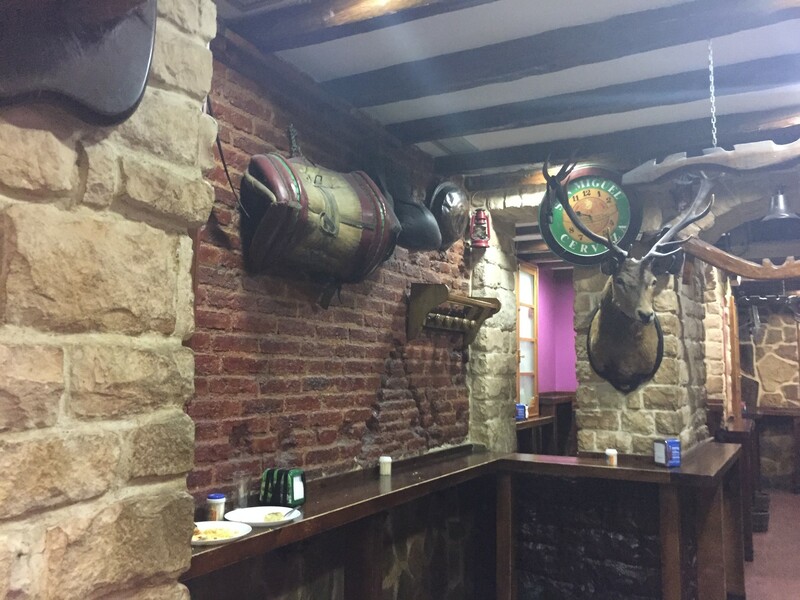 There were deer heads and wild boar heads that adorned the stone brick walls like it was a cabin resort in Colorado. Surprisingly, the food wasn't bad. The tapas consisted of slices of bread with Jamon Iberico and Jamon Serrano and chicken on it with some special sauce. I ate half of my plate and ordered another beer. A few minutes later, he presented me with another plate full of food. I turned him down. I couldn't finish the first one much less accept another plate of free food. He looked at me confused, maybe offended even. In retrospect, I should've just accepted it. I'm guessing it might have looked disrespectful when I refused to take the second plate. Ugh! I'm such an American! You live and you learn I guess. On my last afternoon in Madrid, I was sitting at my hotel bar drinking, you guessed it, Rioja. 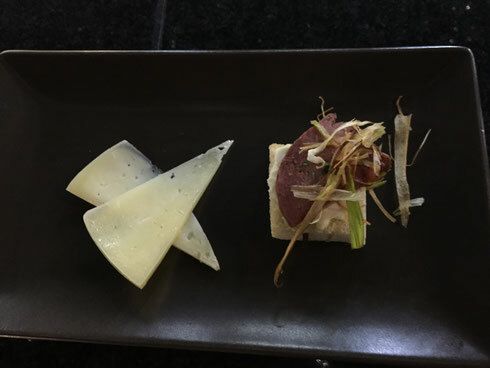 My Filipino bartender, who became my confidant within the passed 4 days served a small plate of Foie Gras drizzled with scallion slivers and accompanied by 2 slices of Manchego cheese to go with my glass of wine. I expected nothing less from a semi-decent hotel. #bougie. She noticed that I was deep in thought. I informed her that I've been in Spain for 7 days and still couldn't find the perfect Paella. She mentioned a couple of places to go to that I've never heard of or researched before. But the best Paella she said was there, where I sat, in the Hotel Regina restaurant. I gave her a befuddled look and asked her why. She said because the chef is Filipino! I laughed out loud! Of course! It would make sense that the best Paella in Madrid was made by a Filipino. For those of you reading this that barely know about Filipino history, the Philippines was under the Spanish rule for 300 years. A lot of things in the Philippines are influenced by Spanish culture. My bartender told me to come back for dinner that night. Unfortunately, I was going to dinner with friends. If we called it a night early, I told her I would come back and order it. Alas, we ended up going out for drinks after dinner and couldn't make it back to the hotel before the kitchen closed. The restaurant we went for dinner had a modern cuisine menu. I didn't find what I was looking for there. So all this time I was looking for the perfect Paella, a Filipino chef might be making it at the hotel I stayed in for 5 days. It begs the question. 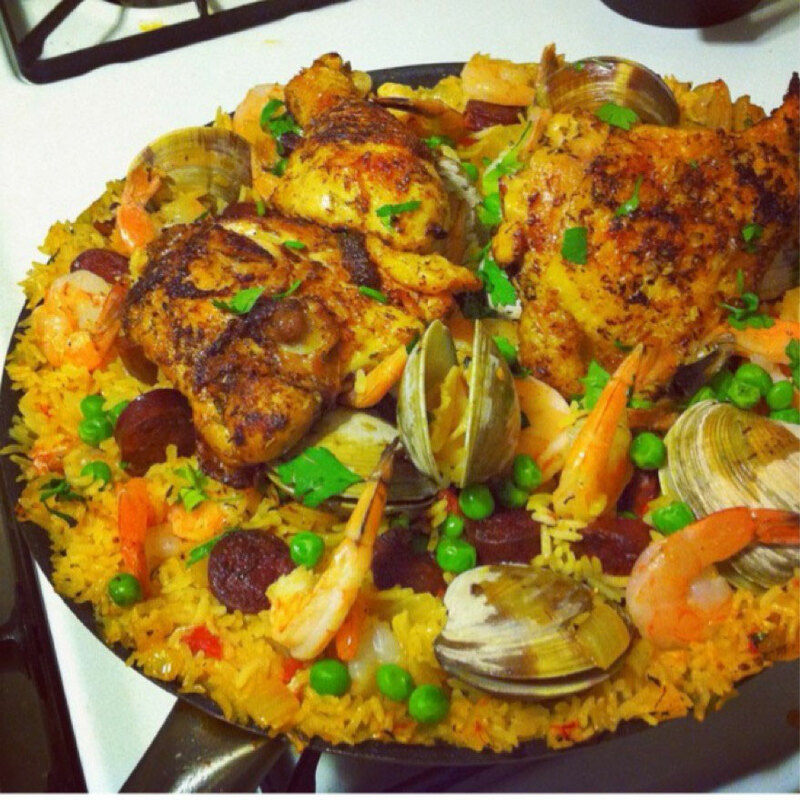 Do Filipinos make the best Paella? Them some fightin' words! I know! I don't want to get stabbed in the back walking down the streets of Brooklyn after I publish this blog post. But I guess I won't know until I go back to do some extensive research. 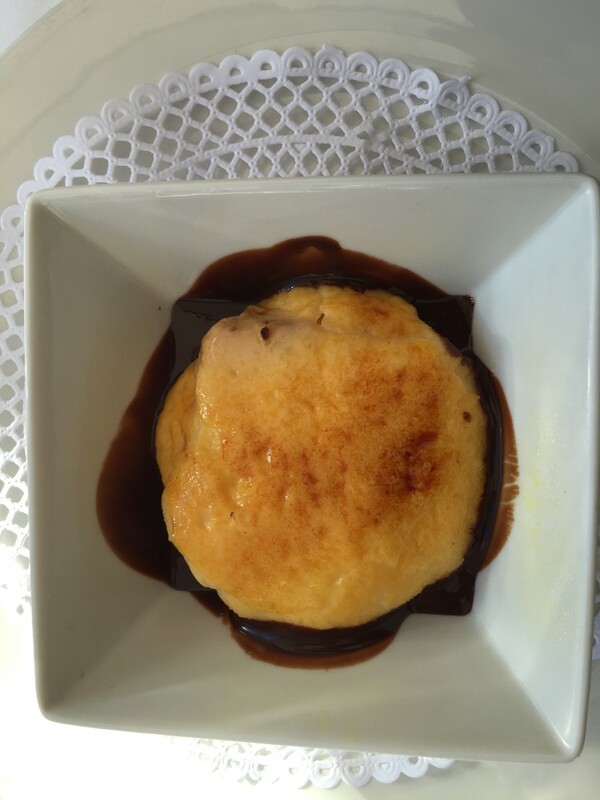 For now Madrid, I will admire recreations of your national dish from across the pond! 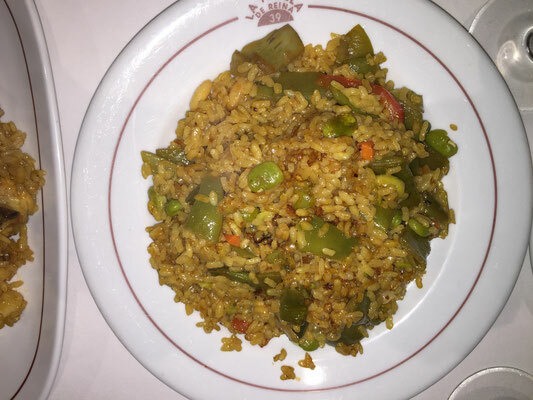 The BEST paella my husband and I ever had in Spain and America was at the Hotel Regina in Madrid when we stayed there in 2011. Wish I had the recipe. The color of the rice was more red than yellow.